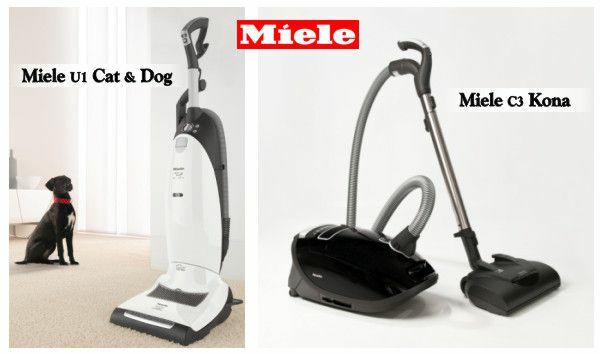 Miele has always been know to make some of the best vacuums on the market. In our opinion, they are the best money can buy! Recent reviews on a popular review focused website as well as well-known publications, have Miele canister and upright vacuums bringing home awards. If you are a fan of canister vacuums, then Miele is your ticket. In fact, Miele loves canisters so much that they make over 15 models. All of Miele’s canister vacuums are easy to use, lightweight, ultra quiet and offer complete suction control for all types of surfaces. Plus the canisters with the larger 13″ wide adjustable power heads help you get the job done faster with a wider path and a beater bar that is adjustable depending on the height of the carpeting. The Kona is a master when it comes to whole house cleaning on all surfaces and even the toughest of pet hair situations. For this reason and many more, the Kona was rated as the #1 canister vacuum on a popular review focused website. If you prefer the convenience of upright vacuums, Miele has you covered as well! Miele uprights are more similar than you might think and all feature an adjustable suction motor, on-board accessories, a swivel head floor tool for easy maneuvering, and ultra-quiet operation. On the same popular review-focused website, the Miele U1 Cat and Dog upright was the top rated upright vacuum this year. The addition of the charcoal in the air filter traps smells being pushed back into the air and the added value of a small power tool for carpeted steps and upholstery is a nice value. Even though we focused on two models that have been highly ranked by customer reviews, all of the Miele vacuums are built around quality and therefore has been awarded the Good Housekeeping Seal for 2016. There are no lemons in this line-up! If you are in the market for a new vacuum, we encourage you to stop by and give one of our display models a test drive.